Henri Nouwen (1932-1996) was a renowned Dutch priest and psychologist, whose sermons, lectures, and numerous books explored the nature of Christian spirituality. After a highly regarded teaching career at such universities as Notre Dame, Yale, and Harvard, Nouwen spent the last ten years of his life ministering to developmentally disabled persons in the L'Arche/Daybreak community in Ontario, Canada. 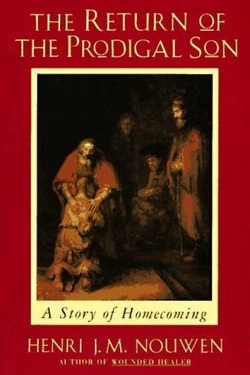 Upon seeing a poster of Rembrandt's The Return of the Prodigal Son, Nouwen traveled to St. Petersburg, Russia, to study the painting firsthand. His deeply spiritual response to that painting and his fascination with the life of Rembrandt led to the writing of The Return of the Prodigal Son: A Story of Homecoming, considered one of his devotional masterpieces. At some point in your study of this great book, you may want to encounter Nouwen in person and listen to him present some of these ideas in a sermon by clicking here. 1) This book assumes that the deepest human longing is to know that God loves us and that we are persons of worth. Do you agree that this sense of brokenness and worthlessness is the place from which we all seek a relationship with God? 2) This book reflects on our relationship with God through three lens: a) the painting by Rembrandt, b) Rembrandt's life, and c) Nouwen's own experience. Do you see any potential dangers in such an autobiographical and artistic approach to "doing theology" or do you find it appealing? 3) This book moves toward the conclusion that no one is finally beyond the reach of God's love and salvation. This view of the unconditional pain-love of God has been explored by others--Shusaku Endo, Kosuke Koyama, C. S. Lewis--but still others find the view unsupported by Scripture. As you begin reading Nouwen's book, which way do you lean on the subject of Christian universalism? 4) Notice the phenomenon of density or layering in this book. By density or layering I mean the way in which we see the theologian Nouwen looking at the life of Rembrandt and through his life at his painting and through his painting at the parable of the Prodigal Son in Luke and through the parable at Jesus. Do you find your experience of the parable enriched by such layering or do you just find it confusing? I was part of an eclectic group of tourists fresh off a cruise ship, eager to see as much as they could of St. Petersburg, Russia, in two days. I was already aware of how my priorities ran counter to most of my fellow tourists. When the tour bus stopped at a gift shop, I spent a couple of minutes watching the feeding frenzy around the wooden nesting dolls and slipped next door to the ancient Orthodox church, still gray with decades of dust from Soviet neglect. But inside the parishioners were busy transforming the church, whose marble floor had been used as an ice-skating rink, back into a place of worship. They were working, they were cleaning, they were singing, and I was blessed. When we arrived at the Hermitage, we were ushered into the ornate palace-turned-museum by a guide who was more interested in the architecture than the art—I chafed to see the Rembrandt. When we finally arrived at the rooms of paintings, the guide urged us on to the Mondrians and Monets and Manets, but I headed straight for the Rembrandt. When we were corralled and herded on to see the just-opened Scythian gold jewelry exhibit, I longed to return to the Return, The Return of the Prodigal by Rembrandt. But during the short time I was there—was it an instant or an eternity?—I stood in silent awe. I had seen it in books, on postcards, as posters; I had read about it, even taught it. But when I first turned the corner and it loomed larger than life above me, it seemed to see me, into me, through me—that ragged, returned runaway; the glowing countenance of the father and his soft, firm hands; the anxious face and fingers of the elder son; even the shadowy figures in the background. As my eyes moved from one figure to the other, I saw myself in each and sensed each one in me. I wasn’t surprised; I’ve been moved by the masters before, in the Tate, in the Louvre, in MOMA. I wasn’t surprised; I’ve often seen something more clearly in the stories of the Bible for having seen an artistic representation of them. But I was surprised; I had rarely if ever seen myself so clearly in a painting, and perhaps even God. 1) Have you like Nouwen ever felt like the younger son, lost, homeless? 2) Have you like Nouwen ever seen yourself more like the elder son? 1) How was Rembrandt like the younger son? How does Nouwen identify with the younger son? 3) How is the temptation of Jesus an example of a radical “No” to the radical “No”? 5) Does it undermine God's grace if we take the actions of the younger son seriously? What did he DO? 1) How was Rembrandt like the elder son? 2) In what ways does Nouwen compare himself to the elder son? 3) How was the elder son also "lost"? 4) Notice the open endings in the parable: we do not know how either son responded to the father's grace. 5) In what sense does Nouwen see Jesus as the true elder son? 1) How was Rembrandt like the father of the parable? 2) What is Nouwen's interpretation of the hands of the father in the painting? 3) What does Nouwen think we can learn about the nature of God from the parable? 4) Whom does God love, value, forgive, reach out to? 5) What is the point of the wealth of the father in the parable? 1) Explain: God became like us (in Christ) so that we might become like him. Do you agree? 2) Explain: Becoming like God means becoming what we were meant to be. Do you agree? 3) According to the parable of the Prodigal Son, what aspects of the nature of God are we to emulate? 4) In summary, in what sense are we or are we potentially like the younger son, the older son, the father?